Hopefully you have had your mid-morning snack prior to lunch. Always try to snack half-way between breakfast and lunch in order to keep your metabolism firing and your hunger and meal portion sizes down. Five to six small meals tend to make people lose weight and perform much better than three square meals. * A second serve of Energy Slim Liquid Formula will further boost your metabolism, reduce hunger and help you avoid that dreaded afternoon ‘slump’. Iron Man: Sliced roast beef, dijon mustard, cheese, mixed lettuce and apple slices. Mediterranean: Pesto, salami or ham, low-fat cream cheese and fresh sprouts and spinach leaves. Gyro Gem: 1-2 home made rissoles cut into strips, tatziki dip, salad leaves. Tasty Tuna: 1 small can of tuna mix with 1 tsp low-fat mayonnaise, ½ tspn mustard or oregano, thinly sliced purple onion and mixed lettuce leaves. Salmon Sensation: Smoked salmon, avocado, cream cheese or tatziki with mixed salad leaves. 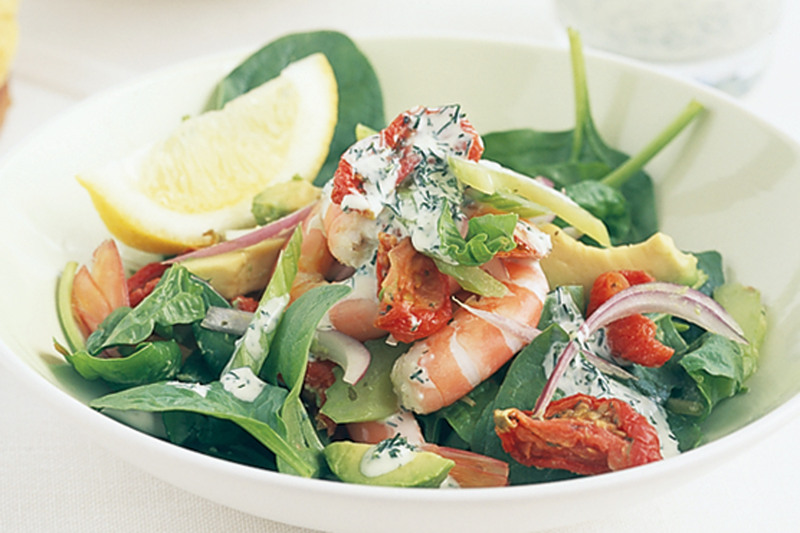 Try this simple prawn salad – no cooking required! Cook brown rice following packet directions. Spread on a tray and set aside to cool. Bring water to the boil (or microwave) peas until soft. 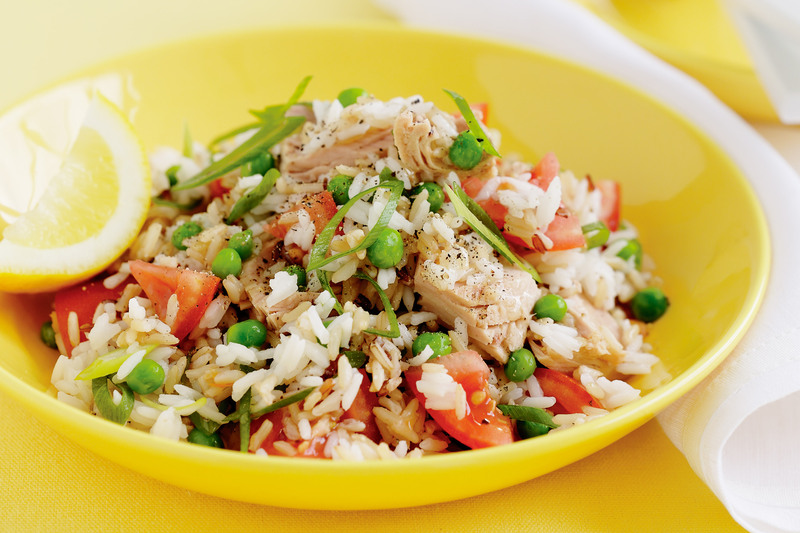 Combine rice, peas, tomatoes and green onions in a large bowl. Drain tuna and flake into large chunks. Add to salad and toss gently to combine. Juice 1 lemon. Cut remaining lemon into wedges. Combine 1/4 cup lemon juice, salt and pepper in a screw-top jar. Secure lid and shake to combine. Pour over salad and toss gently to coat. Serve with lemon wedges. Tip: To increase the protein, make a 2-egg omelette. Cut into long, thin strips and stir through salad in step 2 with tuna. Serves 2. Spread capers over a plate lined with paper towel. Arrange lettuce leaves on a large serving platter. Heat the oil in a small frying pan over medium-high heat. Stir the capers for 1minute or until golden and crisp. Transfer to a plate lined with paper towel.Combine the salmon, avocado, low fat greek yogurt, spring onion, dill and lemon juice in a bowl. Season. 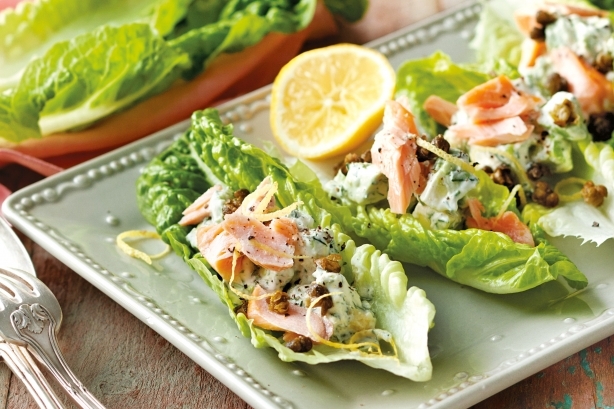 Divide the salmon mixture among the lettuce leaves. Sprinkle with the capers and lemon zest. Season with pepper. Preheat oven to 170°C. Grease and line a 30 x 20cm tray or pie dish. Combine chilli jam and jam with 1 tbsp warm water. Pour over skewed chicken. Refrigerate for 30 mins, if time permits. Boil (7-8 mins) or microwave (4 mins) potatoes until just soft. Drain. Set aside for 10 minutes to cool. Grease a ceramic or baking tray then using the palm of your hand, flatten potatoes slightly. Spray with oil (sprinkle grated cheese and bake in hot oven) or without cheese bbq potatoes for 5 minutes each side until golden and crisp. Grill or bbq skewers for 3-4 minutes each side or until just cooked through. Arrange avocado and fresh spinach on plates. Top with skewers. 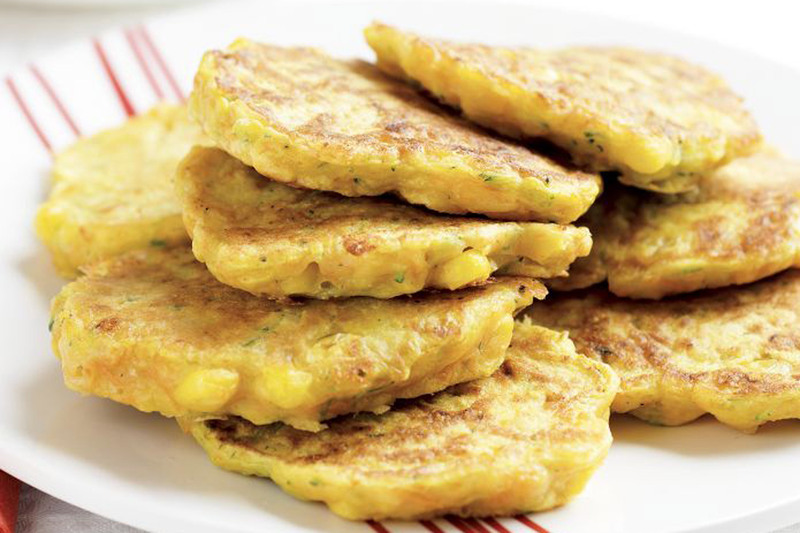 Serve with crisp potatoes and lemon wedges. Grill or barbecue steak for 3-4 minutes on either side or until cooked to medium. Stand for 5 minutes before slicing into thin strips. Cook frozen Birds Eye Stir Fry -Thai vegetables following packet directions. Refresh under cold water. Tip: Dressing- Place 2 tablespoons lime juice, 1 teaspoon fish sauce, tablespoon Kecap Manis, 1 teaspoon grated fresh ginger and 1 small de-seeded and finely chopped red chilli into a screw topped jar and shake well. Mix all dressing ingredients together in a small bowl. Set aside. Cook chicken in pan until cooked through, adding bacon or ham for the last minute. Set aside and .thinly slice chicken across the grain. Meanwhile, gently boil egg 5-7 mins. Set aside to cool. Arrange the chicken, egg, lettuce (and anchovies or tomato) on a serving platter or bowl. Drizzle with dressing and sprinkle with bacon pieces. Serve immediately. Preheat oven to 180°C. Tear the pita bread into large pieces and place on a baking tray. Bake for 6-8 minutes or until crisp. Remove and set aside. Heat a saucepan over medium heat and spray with oil spray. Add the onion and capsicum and cook for 3-4 minutes until softened. Add the kidney beans, cumin, chilli, tomato paste and 1/2 cup (125ml) water. Simmer for 5 minutes or until most of the liquid has reduced. Remove from the heat. Spread the pita pieces on a large heatproof serving plate. Top with the kidney bean mix, then sprinkle with the cheese. Bake for 5 minutes or until cheese has melted. Meanwhile mix the chopped tomatoes with the coriander and set aside. 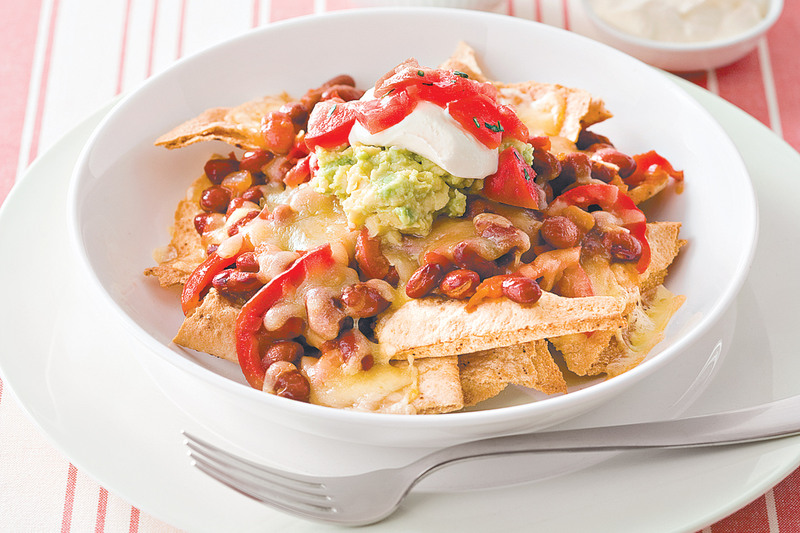 Serve the nachos topped with tomato and coriander, mashed avocado and sour cream. Serve immediately. Look for flat breads which have the highest fibre and lowest carbohydrate contents. Blanch the broccoli, snow and frozen peas in boiling water for 2-3 minutes. Drain, (optional) refresh in cold water and drain again. Place in a bowl with cucumber, avocado, sprouts, parsley and mint. Whisk the juice and oil in a bowl, then season and toss through the salad (add cabbage here if required). Top with crumbled feta. Place desired amount of red kidney beans in a bowl and top with tuna or salmon and yogurt or mayonnaise. Very filling indeed. Using your hands, squeeze grated zucchini to remove excess liquid. Place zucchini in a large bowl. Add corn and carrot. Mix until well combined. Sift flour and baking powder together into a bowl. Whisk milk, yoghurt and egg together in a jug. Add milk mixture to flour mixture. Mix until well combined. Add mixture and cheese to vegetables. Mix well to combine. Heat half the oil in a large, non-stick frying pan over medium heat. Spoon 2 tablespoons of vegetable mixture into the pan to make 1 pancake. Cook pancakes, in batches, for 3 to 4 minutes each side or until golden and cooked through. Serve with chicken, steak, lamb or fish. To make these pancakes even more attractive to kids, spoon the mixture into different-shaped biscuit cutters that have been sprayed with oil. 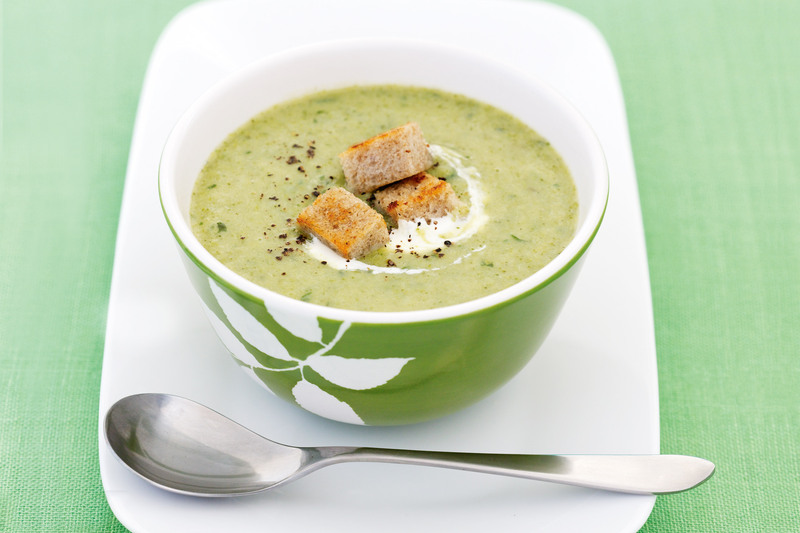 This vegie soup is yummy, packed with vitamin C and budget-friendly, too. Preheat oven to 200°C. Place the bread on a baking tray and spray lightly with olive oil spray. Bake, turning once, for 10 minutes or until golden. Meanwhile, heat a large saucepan over medium heat. Spray with olive oil spray. Add the leek. Cook, stirring occasionally, for 5 minutes or until soft. Add the garlic and cook for 30 seconds or until aromatic. Add the potato, water and stock cube to the leek mixture. Bring to the boil. Reduce heat to low and simmer for 10 minutes. Add the broccoli. Simmer for 5 minutes or until the broccoli is tender. Set aside to cool slightly. Place the broccoli mixture, parsley and basil in the jug of a blender and blend until smooth. Transfer the soup to a clean saucepan. Stir over medium-low heat until heated through. Ladle the soup among serving bowls. Top with sour cream and croutons. Season with pepper to serve. Healthy dinners make healthy lunches too! Just remember to cook extra the night before.